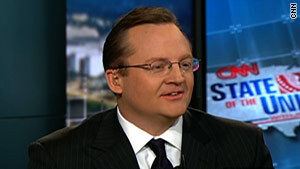 White House press secretary Robert Gibbs says passing a health care bill is "still inside the five-yard line." White House press secretary says health care bill "still inside the five-yard line"
Washington (CNN) -- Democratic efforts to pass a health care bill have stalled a bit, and the immediate focus may be shifting toward health insurance reform instead of quickly trying to pass a comprehensive bill, White House officials signaled Sunday. Robert Gibbs, the White House press secretary, told CNN's "State of the Union" that passing a health care bill was "still inside the five-yard line." His comment pulled back the assessment several weeks ago by David Axelrod, the senior adviser to President Obama, that the bill was on the one-yard line, which in football would mean it was close to passing. On the NBC program "Meet the Press" on Sunday, Axelrod referred to the issue as health insurance reform when talking about next steps. "The American people aren't saying let's walk away from health insurance reform," Axelrod said, citing problems such as rising costs, people denied health coverage for pre-existing conditions, and people losing coverage when they become seriously ill. Asked about a comment by Democratic Sen. Mary Landrieu of Louisiana that the health care bill was on life support, Axelrod said, "I hope that's not the case" for tens of millions of Americans who lack health coverage or are otherwise "disadvantaged" in their relationship with insurance companies. Democratic hopes to get a bill to Obama's desk by now were derailed by the Republicans' upset win in the January 19 special election in Massachusetts to fill the late Ted Kennedy's Senate seat. The win stripped Democrats of their 60-vote Senate supermajority and gave Republicans enough votes to block most legislation in the chamber. Democrats, who were in the process of combining previously passed House and Senate bills at the time of the election, have been struggling since to come up with a new legislative strategy. Republicans remain unanimously opposed to the Democratic health care bills, causing Democratic leaders in Congress last week to caution against a quick resolution. House Speaker Nancy Pelosi said Congress "must take whatever time it takes" to pass a bill, while Senate Finance Committee Chairman Max Baucus, D-Montana, said passing a bill was unlikely before spring or summer. The American people aren't saying let's walk away from health insurance reform. Pelosi, D-California, described a two-step process in which the House would likely vote in coming weeks on a series of specific health care provisions that have popular support. At the same time, Pelosi said, work would continue on finding a way to pass a more comprehensive overhaul later. Pelosi declined to identify which provisions the House might vote on separately, but said "they can move quickly." However, several Democratic aides acknowledged it was unclear if the Senate also would pass the piecemeal health care measures. On Sunday, Gibbs was noncommittal when asked if Obama was considering breaking the health care bill into smaller measures that might be able to gain bipartisan support. "I don't think we know yet the answer on the process of this," Gibbs told CNN. Another strategy has House Democrats negotiating several changes to the Senate's health care bill in order to get enough support to pass it in the House. The bill then would go back to the Senate for a vote in the Senate under rules allowing approval by a simple majority, according to the House Democrats' plan. House Democrats object to a provision worked in by Nebraska Sen. Ben Nelson that exempts his state from paying increased Medicaid expenses, and a 40 percent excise tax on insurance companies that provide the most expensive health insurance coverage. The White House has negotiated with labor leaders to modify the tax plan for expensive health care policies by exempting many health plans covering union workers until 2017. Republicans continued to criticize Democrats for seeking to move forward with a plan they say the American people have rejected in recent elections. House Minority Leader John Boehner, R-Ohio, said on "Meet the Press" on Sunday that the Democratic bills passed by the House and Senate would give the government too large a role in the health care system. "The American people are smart enough to do business on their own," said Boehner. In the Senate, some liberal Democrats have urged Majority Leader Harry Reid, D-Nevada, to use a legislative tool known as reconciliation, which would allow some components of the health care bill to pass with only 51 votes. Several progressive activists held a news conference Wednesday urging the Senate to pass a package of changes through the reconciliation process. Under that scenario, the House would then pass both the original Senate bill and the package of changes passed through reconciliation. Other Democrats in tough re-election fights worry voters would see such a move as legislative gimmickry, reinforcing complaints that Democratic control of Washington has been business as usual.